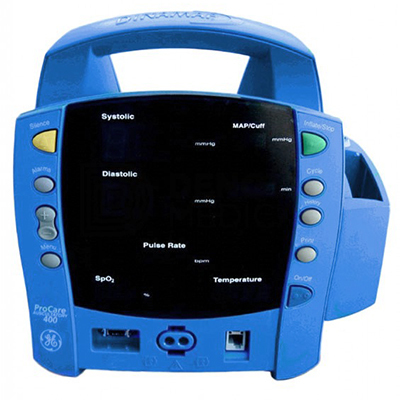 The GE DINAMAP ProCare 400 Vital Signs Monitor enhances productivity with easy to use features and an intuitive menu structure. With a properly-sized BP cuff in place, just press a button to take a BP reading. It's that easy! Comprehensive - One monitor for the entire range of patient populations - Neonatal, Pediatric, & Adult. 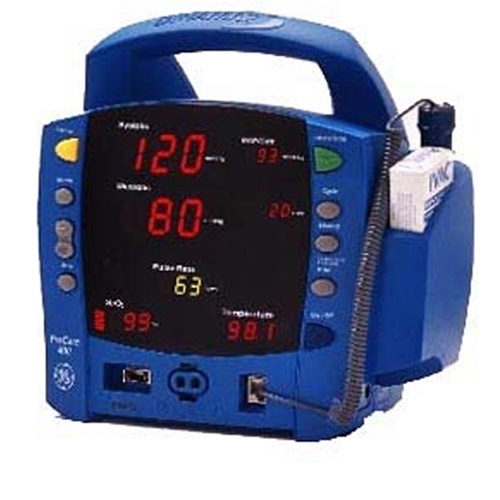 Additional GE DINAMAP ProCare 400 Features: NIBP, Temp, Pulse Rate, and SpO2 along with a built in Pole Mount. 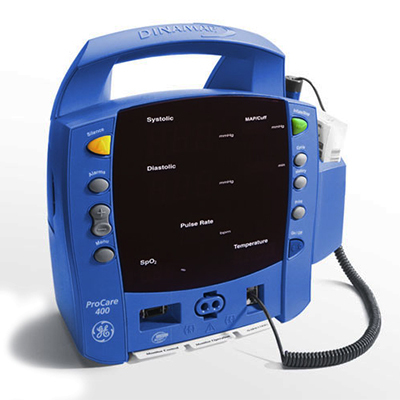 The GE DINAMAP ProCare 400 Includes NIBP Hose and Adult Cuff (New), SpO2 sensor, Oral Temp Sensor, New Battery, Manual, and comes with a 6 Months Parts and Labor Warranty. See below for more information. Large digital displays give you readings at a glance. One button press provides accurate BP reading. Simple menus for customized settings. Cuff pressure range: 10 to 290 mmHg (adult/ped); 10 to 140 mmHg (neonate). Blood pressure accuracy: meets or exceeds ANSI/AAMI standard SP-10 (mean error ≤5mmHg, standard deviation ≤8 mmHg. Maximum determination time: 120 seconds (adult/ped) and 85 seconds (neonates). Overpressure cutoff: 330 mmHg (adult/ped) and 165 mmHg (neonate). Pulse rate range: 30 to 200 beats/min (adult/ped) and 30 to 220 beats/min (neo- nate). Pulse rate accuracy: ±3.5%. Systolic limits (mmHg): 200 high and 80 low. Diastolic limits(mmHg): 120 high and 30 low. Inflation pressure: 160 mmHg (adult/ped) and 110 mmHg (neonate). SpO2 measurement rage: 10 to 100%. 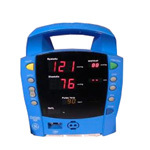 Pulse rate measurement range: 20 to 250 beats/min. Accuracy and motion tolerance: adult without motion: 70 to 100% ±2 digits; neonate without mo- tion: 70 to 100% ±3 digits; adult and neonate with motion: 70 to 100% ±3 digits. Low perfusion: 70 to 100% ±2 digits, 0 to 69% unspecified. Pulse rate without motion: 20 to 250 beat/min ±3 digits. Pulse rate with motion: normal physiologic range 55 to 125 beats/min ±5 digits. Scale: Fahrenheit (F) and Celsius(C). Predictive mode range: 41.1°C and 106.0°F maximum and 35.6°C and 96.0°F. Moni- tor mode range: 41.1°C and 106.0°F maximum and 26.7°C and 80.0°F minimum. Monitor mode accuracy: ±0.1°C; 0.2°F (when tested in a calibrated liquid bath). Determination time: approxi- mately 10 seconds, typical.